The FX-702P was Casio's answer to Sharp's PC-121x series. In certain ways, this machine marks the transition from keystroke programmables such as the FX-601P/602P to "real" pocket computers. 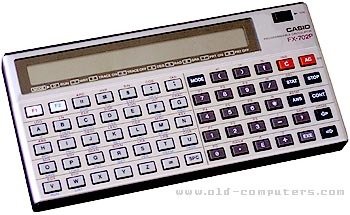 On the one hand, Casio labeled the FX-702P only as "Programmable Calculator", and its non-QWERTY layout of the alphanumerical keys differentiate it from most later pocket computers. On the other hand, the FX-702P had a viable BASIC interpreter which allows for more flexible programming. The hardware mainly consists of four CMOS LSI chips incorporating logical functions and memory, and four display driver chips. The display provides 20 characters in 5x7 pixel matrix, plus a separate 7-segment display part indicating the remaining program memory. Comparable to the Sharp PC-1211 and 1212, the FX-702P had about 2 KB of RAM, divided into 1680 BASIC steps and 26 memories; more memory for variables could be partitioned out at the expense of BASIC memory. A memory expansion slot was built-in, but a suitable RAM module never came out. With this model, Casio introduced their method of dividing program memory into 10 autonomous areas - P0 to P9 - which continued to be implemented in all following Casio models for many years. The nonstandard keyboard makes it most cumbersome to use for anybody familiar with the QWERTY standard; on the other hand, triple assignments of most keys makes programming somewhat more efficient. The built-in interpreter supports a variant of the BASIC language, with some keywords spelled in a different way than the later quasi-standard, e.g. PRT instead of PRINT, or GSB and RET for GOSUB and RETURN. Compared to Sharp's PC-121x models, it has substantially more mathematical and statistical functions, string manipulation functions and a more flexible variable handling scheme. � The FP-10 Mini Electro Printer, a non-impact, electrostatic printer, which used special metalized paper. Thanks to Roman von Wartburg and his site for this information. see more Casio FX-702P Ebay auctions !